Our 4 x 8 10,000 pound industrial floor scales for sale packages are shipped ready to connect and use with all of the equipment and cords you’ll need to start weighing. 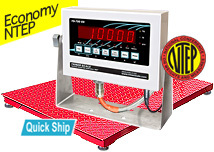 The NTEP certified industrial-strength weighing deck features a diamond plated surface, self-leveling control, and shock absorbing feet. 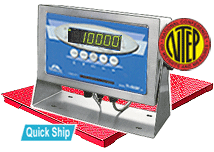 The industrial weighing scale is rated for outdoor and indoor usage, and calibrated in the factory for maximum precision. 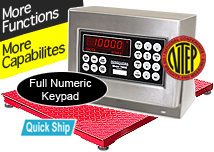 With high-visibility LED digits, our digital indicators are ideal tools for determining the weight of your shipments. Perfect for weighing containers, pallets and skids, and drums, our 4 x 8 10,000 lb. 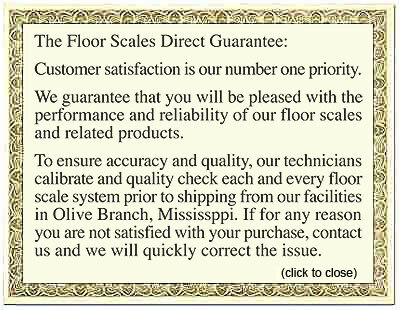 industrial floor scales for sale are the solution for your weighing needs. Enjoy our offer of free shipping to most of the U.S., and utilize our “Quick Ship” feature, which puts your shipment on a fast track for next day shipping. 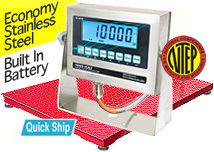 Browse our selection of industrial weighing scales today and let FloorScalesDirect.com fulfill the weighing demands of your business.